Vine leaves have got a slightly naff 1970s image in some ways. After the 1974 war between Turkey and Greece over Cyprus, London had an influx of refugees from both sides. Small Cypriot restaurants serving tarama, hot pitta bread, tzatziki, ect mushroomed particularly around North London. 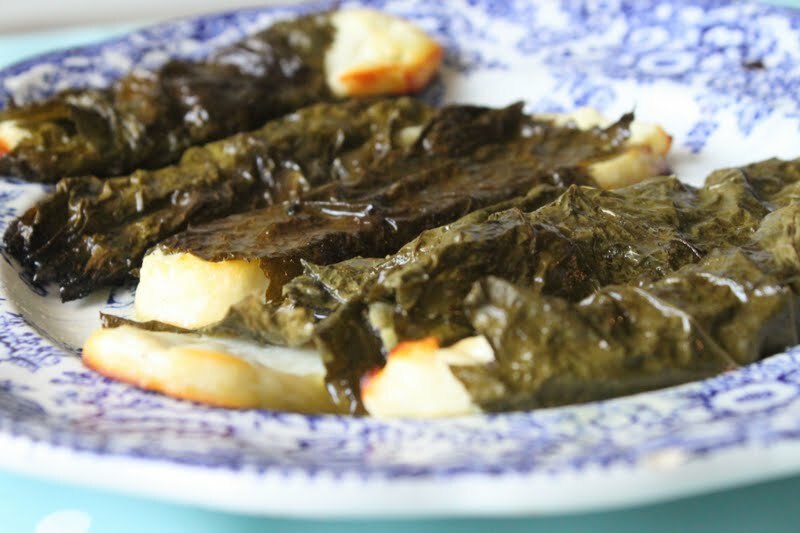 One of the most interesting dishes was dolmades/ dolmas, a rice concoction wrapped in vine leaves. Fresh vine leaves not being as available in London, you could buy them brined in jars and plastic bags from corner shops and even large supermarkets. They fell away in popularity however. 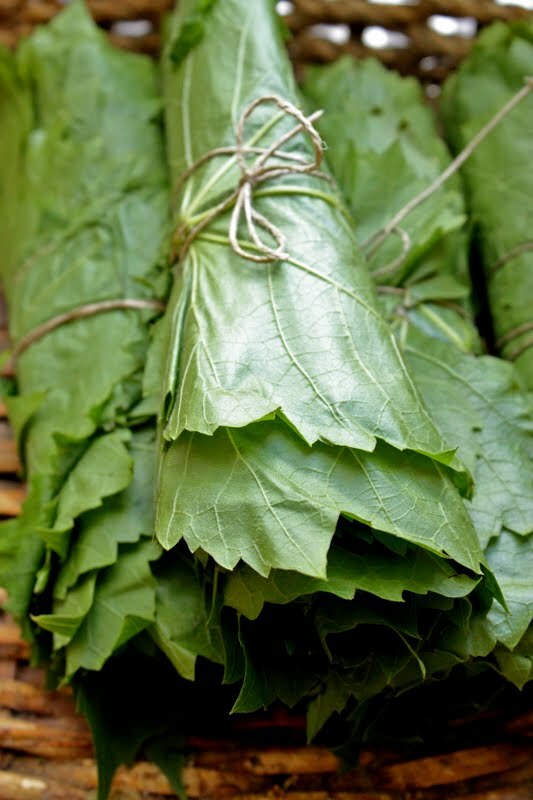 It’s easier to buy sushi seaweed than vine leaves in the big four supermarkets nowadays. Last summer I discovered, via allotmenteer @shoozographer, the delights of fresh vine leaves. 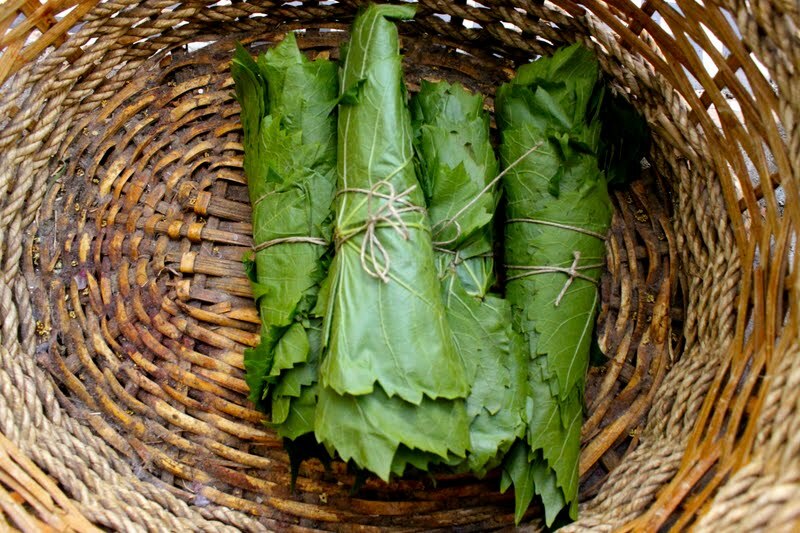 Briefly blanched in hot water, vineleaves have a fresh lemony taste which also complements fish. I’m serving salmon wrapped in vine leaves at The Underground Restaurant at Camp Bestival at the end of July. A few weeks ago I headed up to @shoozographer’s allotment in Tottenham to pick 700 vine leaves in advance of the festival. But how to keep them until the end of July? 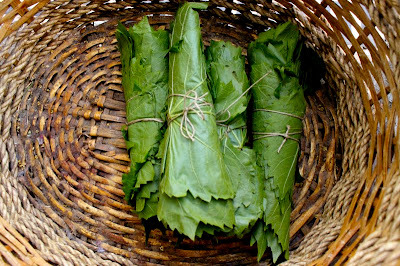 One blog I came across suggested rolling the vineleaves in bundles of 20, putting them into an airtight jar and they would keep. Sceptical, I tried this and I can confirm that it works. The leaves remain in good shape. 1. Pick vineleaves of the size of the hand. Best pick in spring or early summer from unsprayed grape vines. 2. Snip off stalks and brush or rinse free of insects and dirt. 3. Sort into piles, shiny side down, of 20. I rolled them, cigar style and fastened with twine. 4. Now for brining: the old fashioned way is to put enough salt in the boiling water so that an uncooked egg, placed in the water, will float. This, according to Wild Fermentation, is the equivalent of a 10% brine solution: 450g of sea salt to 4 litres of water. I did a lighter brine of 5%: so 225g salt to 4 litres of water. 5. Don’t use table salt, use only granulated, flake or pickling salt, what the Americans call Kosher salt. I use French sel gris. 6. Boil for ten minutes. 7. Half fill your jars or food grade plastic container with the brining solution then carefully pack with your rolled up bundles. 8. Top up the jars so that they cover the vine leaves if neccessary. 9. This will keep indefinitely. 10. Soak in fresh water and desalinate before using. 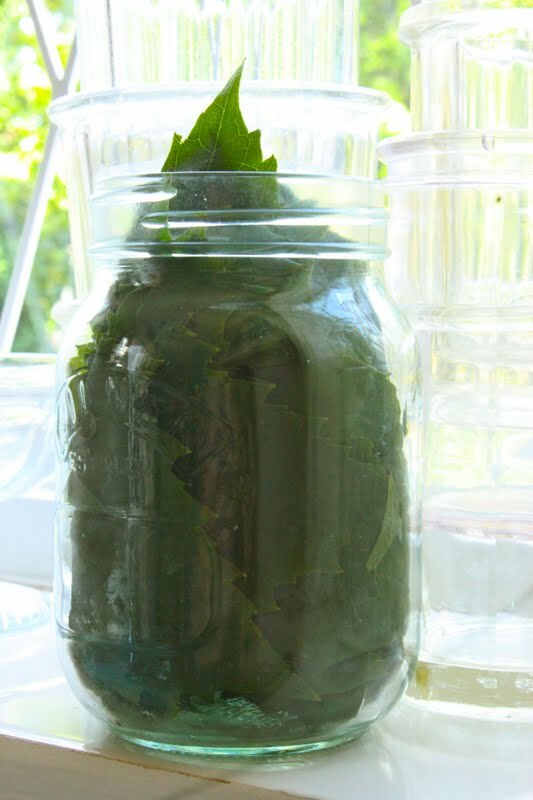 Vine leaves are also good to place in jars with other pickles as they keep them crunchy. You can also freeze or dry vine leaves. Freezing: just lay them flat in piles of twenty and seal in a plastic freezer bag. Drying: run a thread near the stem through a bundles of 20 and leave to dry, hanging. When needed, steep them in boiling water until they recover some of their green colour. (Although I’ve not tried this yet). You might ask, why pick and brine them yourself? Why not buy them? I sometimes find store packaged vine leaves tough and stringy. If you select them yourself then you know you are picking only the tenderest vine leaves. 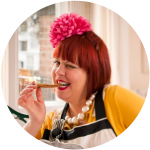 Fantastic retro food. I remeber very well a my granmother cooking with vine leaves. My friend has a grape vine going in her garden – produces a bunch of grapes every year – and I've been trying to persuade her we should eat the leaves since the grapes aren;t up to much. Going to send her this link! We have a grape vine and have talked about using the vine leaves (seemed a waste to put them all in the compost bin). Your post has definitley spurred me on. Thanks for descriptions of different preserving methods. I am wondering if I can use the Fleur de Sel de Noirmoutier that we have, for the brine? Any advice? I don't see why not, but hey, it's very expensive and you need alot of salt. I'd use a cheaper sea salt. But actually I have found the non brined ones wrapped into an air tight jar also work very well.